Speeds: You’re probably going to want different speeds for your fan in case the weather fluctuates quite a bit. You don’t want to freeze nor do you want to be too hot. So having a speed option is ideal for that type of situation. AC Adapter: If you are staying somewhere where you have access to power, but only want to use it if you have to or if your batteries run out, then having an AC adapter would be ideal for you. You know, just in case you need to use it. Energy Efficient: If you’re using it and trying to save money or save the earth, then consider your energy efficient options. These are generally going to run on low voltage. Material: Metal or plastic? This is something that you should consider for durability. Plastic usually doesn’t last as long as metal, especially if you drop it frequently. It’s also a matter of personal preference and weight. Metal is going to be heavier than plastic. Size: Are you traveling light or do you have all of your luggage in the back of your fancy SUV? The size of the fan is only going to matter if you are trying to pack lightly. You don’t want a huge piece of metal or plastic taking up valuable space. Weight: The weight of the fan is important as well as the size. The weight is important, again, for those who are traveling lightly. You don’t want the fan to weigh you down as you are trying to hike. You also don’t want it to be a complete nuisance in that it’s hard to handle. So, if you are considering buying a fan, check out our battery operated fan buying guide. These are ten of the best fans that we could dig up. If you are in a hurry, feel free to scroll right to number one, which is our top pick. If you are on a budget, then scroll down to number two. If you just don’t know, read our whole list. There are certainly some good picks in there for your camping extravaganza. 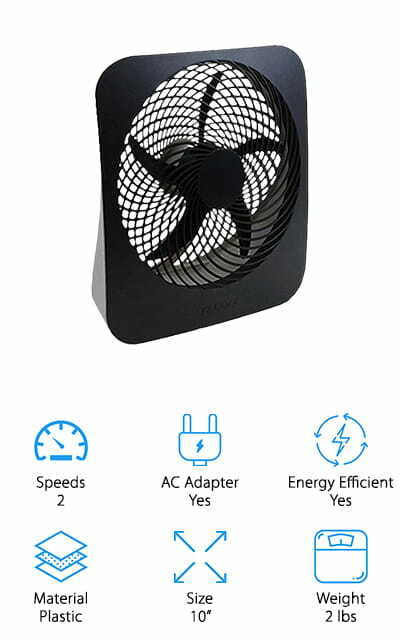 Coming in as our top pick is the O2COOL Portable Fan. This is ideal for both indoor and outdoor use thanks to the battery and AC operation. The energy efficient design supplies optimal comfort and convenience with extended battery life. It has two speed that is created by the 10-inch blade that can be set to either high or low. There is also a convenient built-in handle for carrying and storing. This particular fan runs on D-cell batteries and can run for 43 hours on low and 24 hours on high with just one set of batteries. The whole unit is crafted with plastic for durability and longevity. It’s simple to use and it doesn’t take up much space in your tent or on your desk at home. 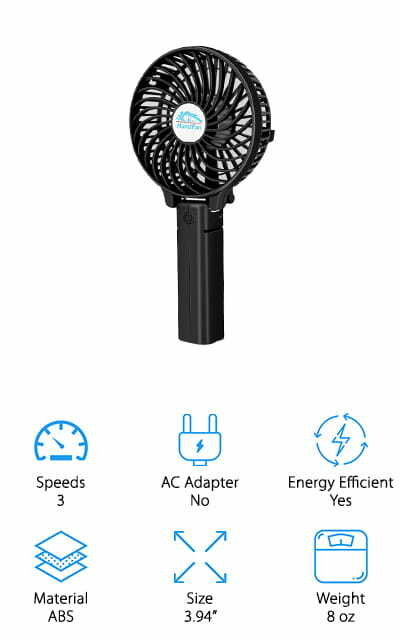 After reading all of the battery operated fan reviews, this one was put at the top due in part to its price, features, and overall value. 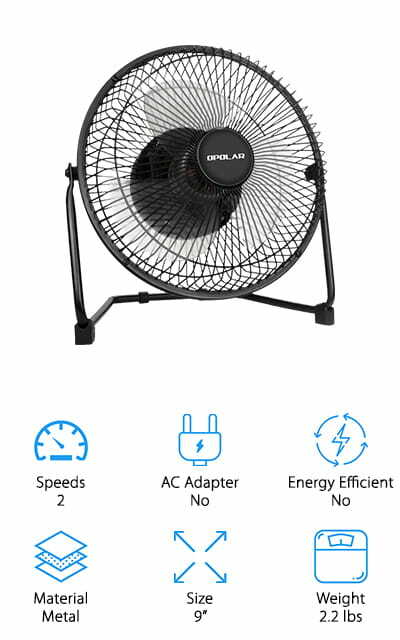 If you’re looking for the best cheap battery operated fan, then look no further than the Dizaul Rechargeable fan. This fan features a mini 4-inch ergonomic palm-sized design and is super simple to carry around because it can attach to your backpack or even your belt loop with the included carabiner. It has high efficiency and low energy loss, making ti energy saving and good for the environment. There are three speeds that come with this little fan and even an LED light on the side for emergencies. The 2600 mAh power bank allows you to charge your phone, cameras, tablets, and more. It is powered by a lithium ion battery that can be recharged for repeated use. It cannot be used without it. Its unique structure makes it very fashionable and ideal for use just about anywhere including the car, at home, on your desk, etc. It can last 3 to 6 hours on a full charge and works by connection via Micro USB. Here we have another O2 cool portable fan & battery operated. 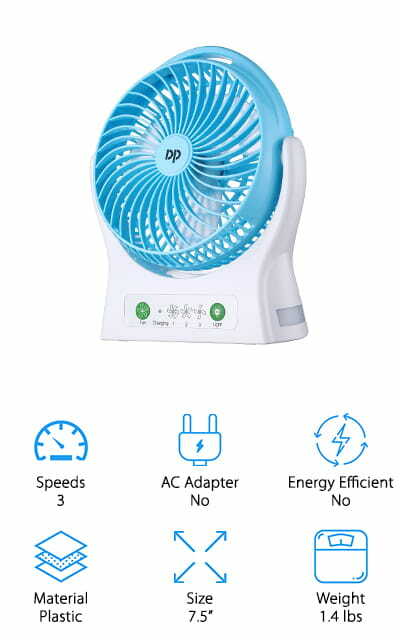 This particular fan can be used in both the home and for camping. It is only 5 inches and features a low and a high setting. With the D-cell batteries, you can get 55 hours of use on low and 30 hours on high. No matter where you are, you can enjoy a cool breeze. You can also adjust the directional flow of the fan and it’s compact for when you want to store it away. The energy efficient design offers you optimal convenience and comfort. Their patented fan blade extends the life of the battery while offering your maximum airflow for longer periods of time. After periods of use, dust can collect on the fan, which is why it is important that you clean it with a dry cloth only. It seems like common sense, but never submerge the fan in water to clean it. This is great battery operated tent fan if that’s what you’re looking for. The VersionTech Handheld Fan is one of the better mini battery operated fans out there right now for a number of reasons. It has a hanging umbrella design so that you can literally hang it above your umbrella or parasol. It is great for outdoor use and has a blowing distance of 3m. It can fold up to 180 degrees and it has a USB port for recharging or you can run it off of lithium ion batteries directly. 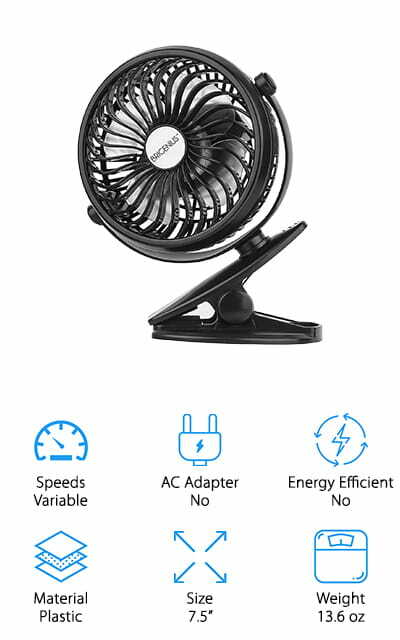 There are three speeds to this mini fan-high, low, and medium. 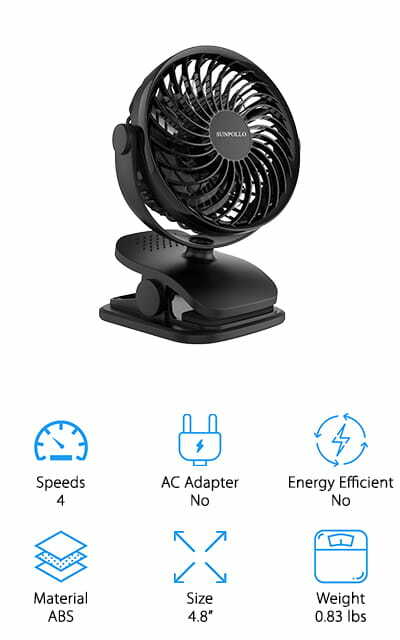 You can adjust the speed setting from the 6-piece fan blade by repeatedly pressing the power button until you reach your desired speed. Want to know the best part? It has efficient power and conversion circuitry that can lower the loss to conserve energy and protect the environment. This fan is suitable for outdoor activities, traveling, and so much more. If you're looking for the best battery fan that also clips on to surfaces, then the ANTMONA Clip Fan might be what you are looking for. This features a strong grip clamp that easily clips onto any surface. It’s ideal for camping, work, school, home, etc. The rubber grips make it so that it won’t scratch the surface you clip it to. The fan also has a 360 degree swivel and move up and down. The durable design is both fashionable and attractive, made from tough break ABS plastic. There are two supply modes, which is rechargeable or battery operated. 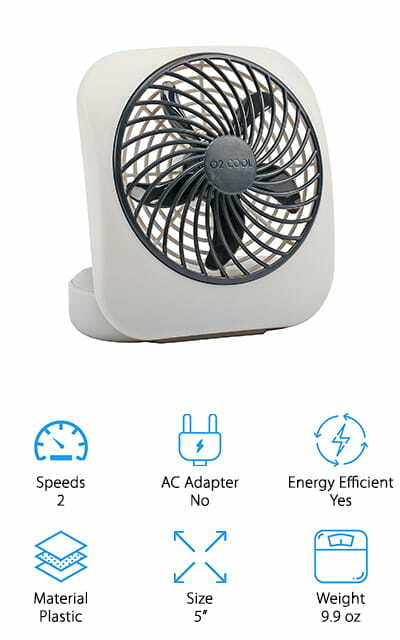 Depending on the stepless speed, which is located on the back of the fan, the unit can run from 1.5 to 4 hours in total before it has to be recharged. You can connect the charger via Micro USB cable to any device that will charge it. It can also be charged with a USB power source. The Miady Portable Fan could be the best battery powered fan for the price, as long as it has all the features you are looking for. It comes in two sizes for your choosing-6 inches and 7.5 inches. This one is the 7.5-inch and it has a powerful motor that gives you a steady stream of cool air. There are three different speeds that you can choose from and the replaceable and rechargeable lithium ion batteries provide you with 2-5 hours of working time depending on the speed you are using. It can also work without the batter via 5V USB supply. The fan head pivots 150 degrees and it is easy to rotate for your maximum comfort. The compact design is ideal for use in a tent, on a table, and it can easily be carried for travel. Here’s the kicker! This fan comes with a 12-month warranty. This powerful battery operated fan runs on either one or two batteries. If there is only one battery in it, it will run for 3 to 6 hours and with two it will run for 6 to 12 hours. 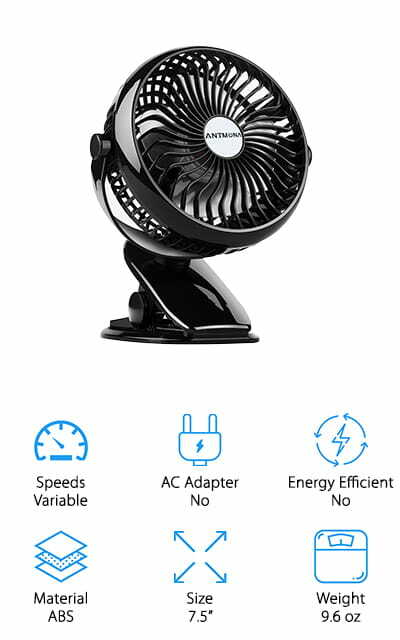 This is the largest USB rechargeable fan with a 5V USB and with their latest technology, the fan will produce an optimal amount of air while remaining completely silent. Each fan will come with two of the highest quality lithium ion batteries. The simple metal construction enhances durability and it can be adjusted 360 degrees up and down. There are also two speeds that allow you to choose your optimal choice of airflow. You will also get a 1-year warranty with your purchase. It’s tough to say whether or not this is the best battery operated fan for sale, but you can let the review do the talking. The SUNPOLLO Rechargeable Fan features a clip that allows you to take your fan anywhere you go. It’s particularly helpful when it comes to baby strollers. On a full charge, it can last 2 to 8 hours depending on the speed you have it set on. It can be charged via USB cable and each one of the lithium ion batteries has been tested three times by SUNPOLLO to ensure quality. There are four speeds that the fan can be set at for more airflow, but less noise. The minimal 4.8-inch frame is ideal for small spaces and the perfect curve design and anti-skid design offers you more stability when the fan is in use. This would be great for clipping onto a tent for camping as well. The BriGenius Clip On Fan has a very unique design. Its powerful, fashionable, and portable. 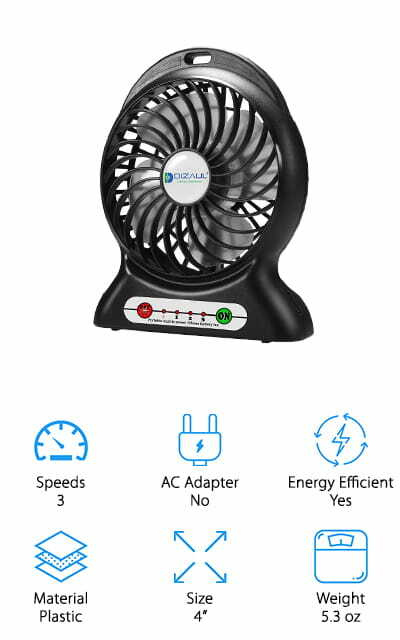 It could be one of the best doorway fan/battery operated fan that is also compact enough to take with you on a camping trip. The high-quality motor has a max wind speed of 75 feet per second and a low noise output. The batteries are both replaceable and rechargeable via USB charging. You can also use a power bank and other USB charging sources. The clip allows you to put it anywhere you want whether it’s the backseat of a car, on a tent, in a doorway, and so much more. You can adjust the speed with the small wheel in the back for stepless speed regulation. Overall, this small and portable clip-on fan is powerful enough to give you the breeze that you’re looking for on a hot day no matter where you are. If you’re looking for the best 10-inch battery operated fan for camping, this one could be it. It’s a little on the heavier side, but the air output is great. 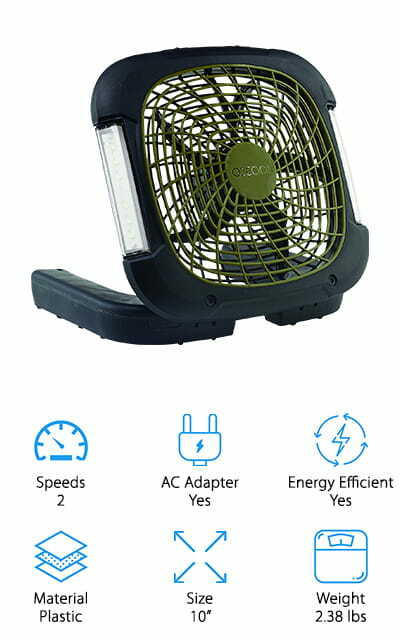 The reason that this may be the best battery operated fan for camping is because of its size and features. If you don’t have power where you are, you can simply run it off of batteries. If you do have a power source, you can simply use the AC adapter for non-stop air. The energy efficient fan blade extends the battery life while giving you a maximum output of airflow. The fan also comes with a built-in handles that allows for easy carrying and storage. There are two different speeds that you can choose from and the speed you use depends on how long the battery will last. On the sides of the fan, you will also find LED lights in case you need emergency illumination.